Street Art is an ingenious form of outdoor advertising! One would certainly grasp what the above picture is trying to convey. This is an illustration of what we call Wall Graffiti or Street Art. 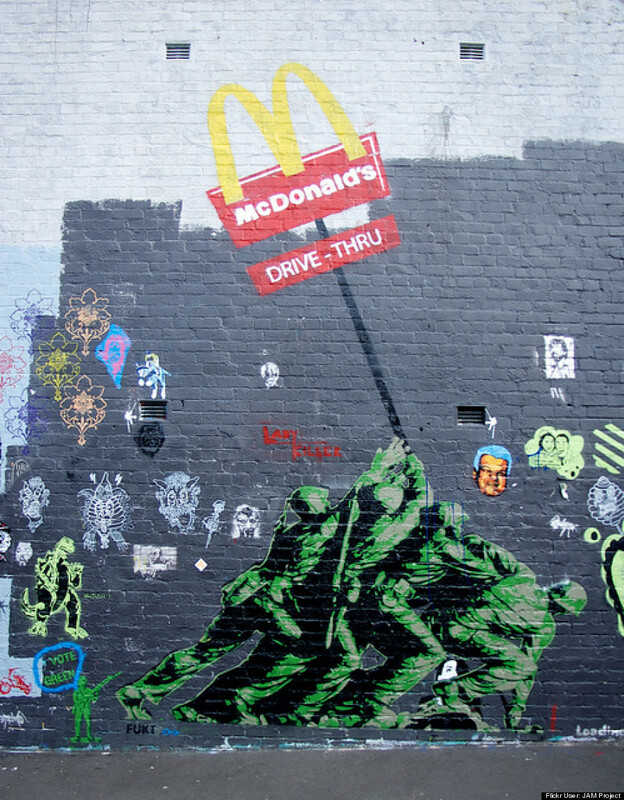 Did you know that the existence of street art traces its roots to the ancient times of human civilization? Plus, that the wall scriptures and stone paintings were the earliest form of art which gained huge impetus in 1980s and went on to become a symbol of Modern Graffiti. Now these days we see various brands like Coca Cola, Kit Kat and Sprite, to name a few, resorting to street art as a way of expressing themselves or putting their message across. We’re sure that you also find these street arts vivid and spectacular which leave an enduring impression on our minds! The street arts give you out-of-the-box ideas and not just any regular, boring picture that fails to capture your audiences’ attention. So we need to identify such gaps prevailing in outdoor media and try and overcome those. But luckily, now we have a solution where we can mix both street art with outdoor advertising to capture the imagination of our target audience. And this is exactly where billboard advertising comes into the picture. There’s no reason to be surprised that now even big and well-placed brands as well as ad agencies are practicing this form of outdoor media advertising. They are persistently thinking of queer ways of developing their brand consciousness amongst the people. Following are some outstanding creative instances of billboard advertising which are doing exactly the same as described above. Find out which one’s your favorite? Believe it or not, but McDonald – one of the world’s biggest fast food chains – has managed to get the sweeping attention of people for a suite of restaurant remodeling which has gained consumers acceptance at various levels. This is mainly done through inventive advertisements and this above street art is an apt example. Who doesn’t know about Oreo? This one of the most loved brands of cookies in America commemorated its special day, i.e. 100th birthday with an exceptionally well-designed campaign and the artists came up with a sequence of exciting animations. It goes without saying that street art has a tremendous potential as an effective outdoor media advertisement that operates in a dynamic space to naturally draw people’s attention. In fact, the premium brand as BMW is no way lagging behind in the race and very recently launched an attention grabbing advertising campaign to advertise its not-so old edition BMW i3, which is known to be the world’s first best fully electric car. The company has got customized billboards for the campaign integrated with ‘Halo’ lightning to result in an “after-dark glow effect around 2D cut-outs of the i3”. Quite interestingly, major parts of the car are conspicuously illuminated to draw attention towards its hi-tech environment friendly features as well as electric working in the inner part, whereas its state-of-the-art printing technique highlights the contrast with the backlit surface. Heard about Spotify? In fact, it also had a good time in designing its billboard advertising campaign with an unusual heading, which said Thanks 2016, it’s been weird. Spotify made use of its huge reservoir of customer data and in-house designed posters by drawing inspiration from some of the peculiar facts and figures linked to the world of digital music service and highlighting some funny as well as striking outliers covered up under the façade of stored information. It’s true that a picture speaks more than 1000 words and in case of Leica, billboards created by their team bespeak how simplicity more often prove to be the most ingenious and effective form of design. Each of its billboards is an amplified image of the object behind it, exhibiting the superior zoom quality of the camera which doesn’t fail to notice any detail. In the end, all we can say is that street art is an attention-grabbing medium of advertising. This form of advertising is also called as Guerrilla advertising where the companies hire artists to get over the regular media chaos, simplify and stand-out. If you can also tap the current trends then it’s quite likely that even you can excel in this street art promotional technique. Quite similar to other outdoor advertising methods, it gives you a mass reach without any hassles and if you can let your creative juices to flow then the impact of these street arts would be even greater on the human consciousness.